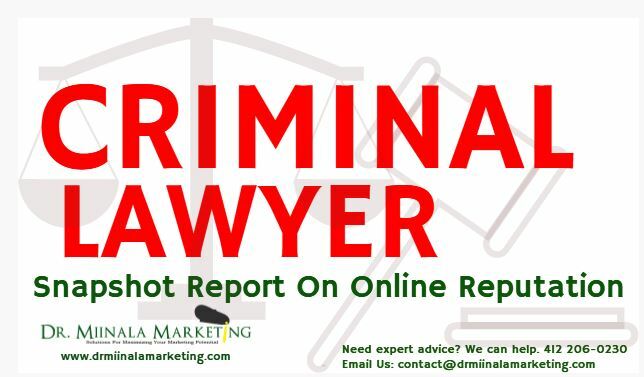 Dr. Miinala Marketing has announced that they are now offering free online reputation snapshot reports for criminal lawyers. The company states that attorneys can now request the free report on their business reputation, which could be very beneficial. "You have to know how people see you; what they think of your business," says a spokesperson for the company. "To this end, we've decided to offer a free report of your business reputation, which will enable you to improve on your marketing tactics as needed." The company states that online reputation is crucial, even for businesses without an online presence. Studies show that more than half of the adult population of the world now have smartphones, and of those, nearly 95 percent use their smartphones or another digital device to research places of business. This is particularly true, the company says, of criminal lawyers. The report offer can be seen at http://drmiinalamarketing.com/free-reports/. "A criminal is a very tedious, very intricate thing," says the company spokesperson. "You certainly don't take your criminal case to just any lawyer, which is exactly why criminal attorneys have to ensure that their online reputation is positive. Otherwise, they are losing potential business." Dr. Miinala Marketing states that there are a number of things that can instantly ruin a business reputation online, and given that most consumers today research online before choosing a business, just one bad review could be catastrophic. The company states that a snapshot of the business reputation can help lawyers to keep their clients coming in. More about the company can be seen on their official Facebook page at https://www.facebook.com/drmiinalamarketing/. The spokesperson states that Facebook, along with other social media, are means of improving online reputation, and that there are various other strategies that the company uses to ensure the best results for their clients. Those interested in learning more about the importance of an online reputation or how criminal attorneys can receive their free snapshot report on their own online reputations can visit the company on their official website. Interested business owners can also connect with them on LinkedIn at https://www.linkedin.com/company/dr--miinala-marketing.